Tungsten Analysis: WC Preview Part 15 - Please can a seed go out so I don't have to analyse Norris/Huybrechts? 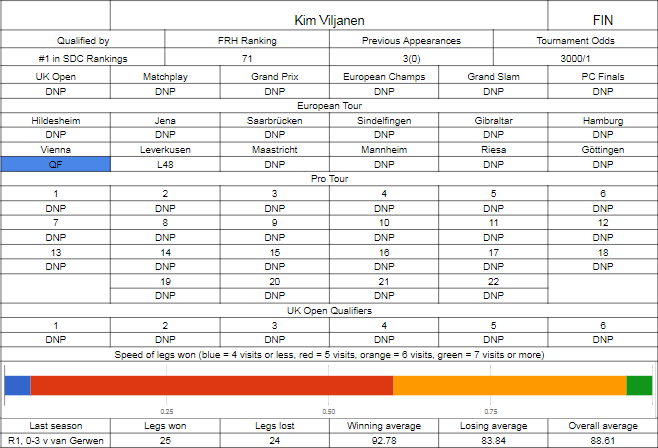 WC Preview Part 15 - Please can a seed go out so I don't have to analyse Norris/Huybrechts? I don't want to look at that second round match for two reasons - Huybrechts is a player that has great stats but keeps losing, whereas Norris is a player that has weaker stats, is all over the place in Europe, but on TV keeps winning. Let's look at the Norris game first, where Alan's defending quarter final money. He kicked off pretty well - two good runs in UK Open qualifiers, beating Cross and Gurney in the run to the quarter final, and beating Bunting, White and Kyle Anderson in the semi final effort. That got him into round 3 of the UK Open, where he dispatched Yordi Meeuwisse with little trouble, Benito van de Pas and Michael Smith could only manage five and six legs respectively, while Kim Huybrechts pushed him all the way to 10-9. He should have made the final - at 9-9 against Price he is on 40 to break the Price throw and then throw for the match, and he proceeds to lose 11-9. Just before the UK Open, Norris got the only ranking win of the season in the first Players Championship event, getting Cross first round, then comfortable opponents before back to back Aussies in Anderson and Whitlock from the quarter final stage before defeating surprise package Peter Jacques 6-1 in the final. Norris would add a semi final and two quarter finals in Players Championship events before the Matchplay, where wins over Kim Huybrechts (again) and Dave Chisnall in overtime got him to the quarter final stage, leaving it a bit too late to start a comeback against Adrian Lewis. 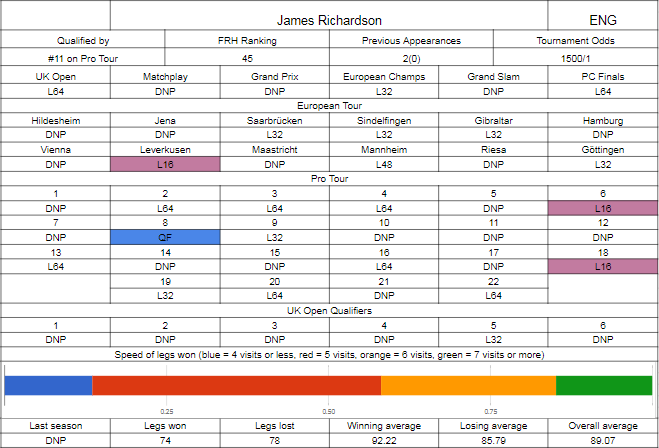 Throughout this time, he's been seeded for all the European Tour events, but done relatively badly - playing every event, he's gone out at the first hurdle six times (and got no order of merit points as a result), and then been one win and done on every other occasion. He'd pick up one win at each of the Grand Prix and European Championships, beating Pipe but losing to Henderson, then beating King but not winning a leg against Simon Whitlock. Norris qualified for the Grand Slam as a wildcard but got a group of death with Durrant, Wright and Cadby, only picking up the one win over the Aussie in a decider. Most recently he lost in an opening game to Jelle Klaasen at Minehead. Viljanen is having a fourth stab here - he got van Gerwen after beating a Canadian qualifier last time out, beat Sven Groen in a prelim before losing 3-0 to Kevin Painter the year before, and the year before that he lost in a prelim to German qualifier Sascha Stein. Viljanen topped the SDC order of merit by some distance, having a world championship berth locked up before the final weekend of play, and in all he won seven out of the ten SDC events, quite an impressive run on a regional level. With the SDC also having a qualifying spot for European Tour events, we've been able to see Viljanen play on a big stage a couple of times. The notable run was in Austria, where he got all the way to the quarter final, having edged fellow regional qualifier Ratajski in the opening round, then Peter Wright again 6-5, before cruising to a 6-2 win over Chris Dobey in the last sixteen. Joe Cullen put him out 6-4 in the quarter finals, but it showed somewhat of what Viljanen could do on his day. The other event he made was the very next weekend in Leverkusen, where he went out 6-3 to Mervyn King in the opening round. We've seen enough of the Scandinavian players to know the sort of standard they're capable of playing. Norris, on his game, should be better than that, but if he starts messing about with missing doubles or hitting a few random visits without trebles, then Viljanen has more than enough to be waiting to pinch legs, and if he plays as he did in Vienna, where he was clocking off plenty of legs in fifteen darts, he could deny Norris too many attempts to break. Norris is only just above 50% on all legs won in fifteen darts himself, and isn't up in double figures percentage wise for twelve dart legs, so even if Viljanen has a few legs on throw where he would need a sixth visit to check out, it's not a given Norris will be there. Could be an interesting tie. Huybrechts is a weird one to call. His speed of killing in four or five legs is for all intents and purposes the same as Peter Wright's. The problem comes in that he doesn't do that often enough and there's lots and lots of legs where he just lets the other guy win. 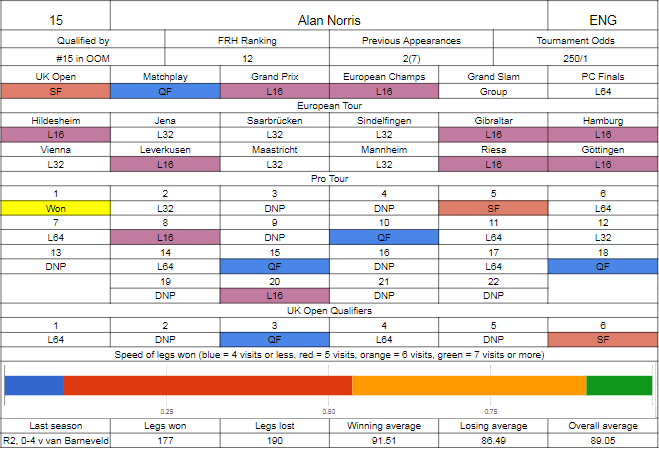 This year has been generally disappointing, outside of the UK Open, where as we mentioned earlier he went out to Alan Norris in the quarters - he lost at the first stage in every other major - Norris at the Matchplay, Thornton at the Grand Prix, didn't make the Slam (wasn't expecting to make two Sven Groen references in this whole series of writeups, let alone in one section, but there you go) and was dumped out of Minehead by Chris Dobey. He's normally good for at least one ranking win in a season, but hasn't got close that often - two finals, one in Riesa where he took Wright to a deciding leg but would have needed a nine darter to claim it, and one on the Pro Tour way back in April, where he lost to Daryl Gurney having beaten Wattimena, Wright, Wade in a whitewash and James Richardson. Only one other European semi final is a bit surprising, but when you lose your opening game six times it does limit your chances of doing so, and only adding two semis and two quarters in the Players Championship series is possibly below par - half the time he didn't even make the board final. Richardson is a player most people know for shocking Raymond van Barneveld 3-0 in 2012, and will be looking for this to be a revenge game, as it was Huybrechts who knocked him out 4-1 in the following round. He did return the following year and lost 3-1 in sets to Andy Hamilton in the first round, but it's his first appearance since then and is making his way back after a couple of quiet years, reaching the stage where he did briefly lose his tour card. This season is somewhat similar to last season, where he did most of his best work in Europe - last year he qualified for the European Championship and beat Caven before going out to Kyle Anderson, and would repeat that feat this year, except without the beating Caven bit, as he drew a slightly harder opponent in Simon Whitlock and fell 6-3. Qualifying for six out of twelve events is a decent return, and he finished with an exact 6-6 record on the European stage, mostly just winning the opening game and then losing to a seed, breaking onto the Sunday in Leverkusen where he edged out Benito van de Pas before going out to Dave Chisnall. He did make the UK Open (only just, must have been on countback), and fought past Alcinas and amateur qualifier Neil Smith to make the money, and got eventual winner Peter Wright immediately to end his run. The Players Championship has been a bit disappointing with just the three board wins and one quarter final, but there was enough there to make Minehead, where he had a dart to knock out Robert Thornton but couldn't take it. 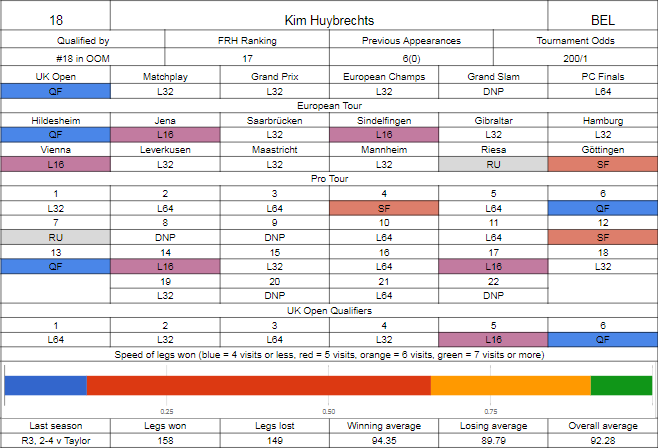 Huybrechts if he plays his best darts wins, but as stated, it's a case of actually doing it, which he doesn't do that often. Kim does at least have a 5-0 record against Richardson, but their two matches this season finished 6-5 and 6-4, while Richardson has shown his best form over the last couple of seasons on bigger stages, so this is certainly not a gimmie.